My ten-year old is participating in Royal Rangers. It’s a lot like Boy Scouts but with a biblical emphasis. If you have younger children, either of these organizations are a great way to instill some great life-long values in your kids. They both provide hundreds of opportunities for earning merit badges through a variety of activities and learned skills. And each organization has an annual Pinewood Derby. They give you a block of wood and four wheels and you and your boy are expected to design your own car to race against all the others. I’ve probably helped my boys make a dozen cars by now. Some were last-minute affairs that came in as the first or second fastest car. For others, we may have spent weeks on designing, cutting, sanding, and applying several coats of paints, only to have the car come in last. But in all cases, it was a great experience for the kids…and me. This time, my youngest is going for a merit badge in hobbies. One of the requirements is a woodworking project. It has to be a useful, practical item. Given his size and age, I knew it had to be something fairly simple but used a variety of tools. Unlike a lot of dads, I wanted him to do the work. So here’s what I came up with: A base for our pepper mill. You know how a pepper mill “poops” all over the table or counter whenever you set it down? Cracked pepper all over the place. So I decided we needed a base that would be the home for our pepper mill. It should have a recess underneath to capture all that cracked pepper that leaks out. 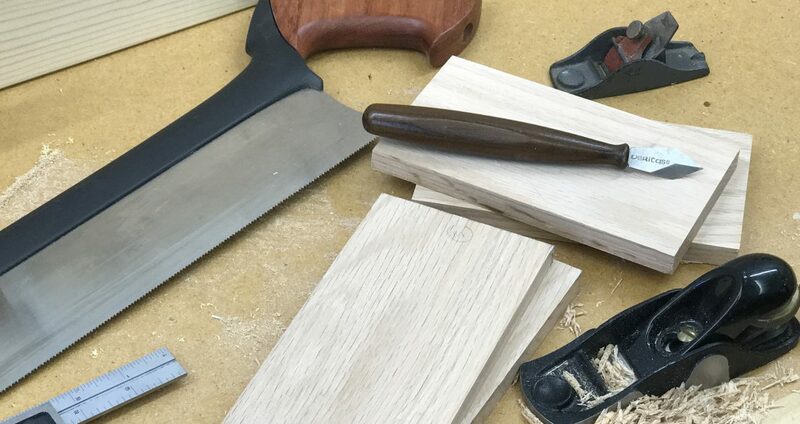 We started with an oversized chunk of white oak about 1-1/2″ thick. My son used a ruler and small combination square to mark out a 3″ square. We measured the diameter of the base of the pepper mill to get the diameter of the recess we needed to create. To create a “ledge,” I wanted a rabbet for the pepper mill to set down in. And I wanted a deeper hole for the cracked pepper to fall down into. So, figuring a 1/4″-wide rabbet, we needed to subtract 1/2″ from the overall diameter to get the size of hole to drill. You can download the SketchUp model here to see what I’m talking about. In our case, we needed to drill a hole 1-3/4″ in diameter about 3/4″ deep. My son chucked the Forstner bit in the drill press, aligned the fence and workpiece under the bit, set the depth stop, and drilled the hole. Before cutting the base to size, we used a rabbeting bit in the router to rout a recess about 1/8″ deep. For this step, I did the routing for safety reasons. Finally, we cut the blank to size on the table saw then went to the belt/disk sander to slightly round the corners and edges. A coat of wipe-on oil/varnish blend finished it up. My son was thrilled with the end result. While still in the shop, I made him review all the tools and processes we used to make the base for the pepper mill. He can proudly say he did it all, except for the routing. Posted on February 21, 2010 February 22, 2010 by Randy MaxeyPosted in Finishing, WoodworkingTagged Kids, Woodworking.